A dash of parody, a pinch of lightheartedness, a touch of tribute, and a large dose of love for the jRPG genre! 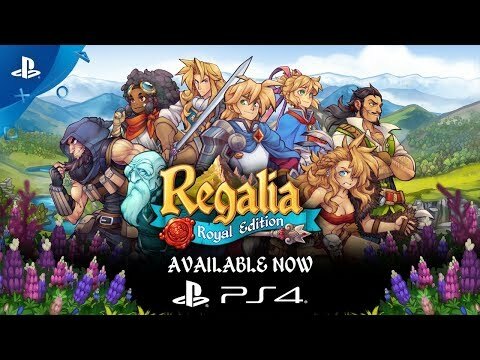 Regalia: Of Men and Monarchs is a vast and vibrant jRPG with skippable battles, strong artstyle and a whole lot of heart. 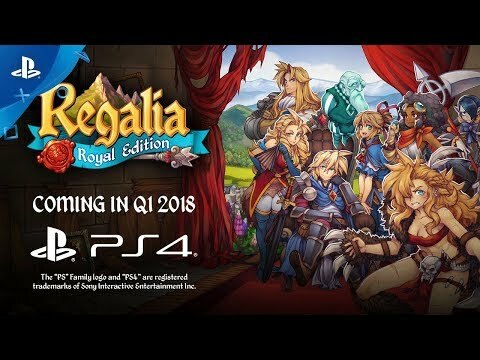 Regalia draws inspiration from JRPG classics, but also delivers a modern mix of good old adventuring and dynamic storytelling. It’s a tactical RPG, but it’s actually a game about the restoration of your kingdom, bonding with vibrant characters met during your journey, embarking on the most peculiar quests possible, and bringing back your best jRPG moments in an up-to-date, accessible style. It can also be a game about unforgettable, rewarding combat and well-thoughtout tactics, but that’s for the player to decide -- there’s always a possibility to tone down the difficulty level or even skip a battle if someone can’t wait to see what other plot twists lay before him. Omitting the battles won’t make all the problems go away, though -- there’s always something to be done in Ascalia, like dealing with teammates’ quirks. Take Theo, for example, a vampire with a blood aversion, whose biggest dream is to become a hairdresser; or Esther’s ambition to make a DIY atomic bomb with just a few gears and spare parts. Oh, and there’s always a fishing mini-game! Embark on an adventure that will remind you of your best JRPG experiences -- assemble a party of valiant individuals, manage your realms, forge alliances, and vanquish your foes in challenging turn-based combat! The Grimoire allows players to challenge themselves in randomly generated battles in return for additional visual customization options for the party members. It is divided into chapters and within the Grimoire all sorts of unexpected combinations can happen. What happens when a young prince has to man-up overnight? After Kyle Loren’s father’s passing, he inherited a wondrous land far, far away. There’s a catch, however, the realm is drowning in terrible debt. Now, through some good old-fashioned adventuring, he has to return his family seat to its long gone greatness! 39 character skins to unlock! REGALIA: ROYAL EDITION, REGALIA logo and, PIXELATED MILK logo are registered trademarks of PIXELATED MILK. All rights reserved. Klabater and Klabater logo are registered trademarks of CDP sp. z o. o. All rights reserved.